An e-mail has been sent and she has 48 hours to respond before a new winner is chosen via random.org. Nothing is really new other than it's 01/2011 but every year in January, a renewed interest in losing those extra pounds resurfaces across the board. It hits me about every nanosecond and even though it seems so easy to do, it isn't. As I embarked into this new year, I decided to kick it up a bit and put out a challenge to my family. In our group, we have all of January and February to lose weight. The winner with the greatest percentage lost, wins $100. My incentive is to win so I don't have to give away the money and of course, you know their incentive. My oldest is participating too and with her recent pregnancy, she is looking to shed those extra pounds she picked up and her approach is via Weight Watchers. One of the benefits of that program is to inclusion of Progresso Soups since they have 40 flavors with a 100 calories or less (per serving) and one serving counts as one point for WW. This diet is ideal for her since she loves soup and is an avid Progresso Soup consumer. With the new year, Progresso is kicking it up to encourage everyone to enter the Souper You Debut contest from January 3rd until March 16th. You can also enter on Progresso's Facebook page to win a complete make over in New York City. If you have never been to NYC, you are missing out as it's such an experience to visit the city, walk, take the subway and so much more. I want to win! Three grand prize winners will be awarded a trip for two to New York City from May 20th-22nd. The prize includes roundtrip airfare, a two-night stay in an NYC hotel, a full makeover, a guided wardrobe shopping spree with a personal consultation at a New York City department store, and $1,000 in spending money. Once the 10 finalists are announced, you can visit Progresso on Facebook from March 30th through April 13th to vote for your favorite. Visit the Facebook page to download a coupon for $1.00 off four (4) cans of Progresso Soup and to check out makeover videos provided by MyStyle.com and the Style Network. Be sure to also "Follow" Progresso on Twitter to keep up with the latest news from Progresso. As part of my participation in MyBlogSpark, I received a Progresso Soup Gift Pack that included five cans of Progresso Soup (which were all delicious minus the Clam Chowder since I don't like clam chowder), a large yoga mat that rolls up and comes with a cool carrying case, a water bottle, set of aerobic bands, a carrying case for keys/wallet and wrist bands. This was a great prize pack to kick me off in my endeavor to get in shape and get healthier. I had the Light Pot Roast soup last night and it tasted so good. It wasn't salty and it was light enough to make me feel good yet didn't leave me feeling like I missed out on something. I love Progresso Soup and it's the one we buy the most. Now, what you are also waiting for, the giveaway! 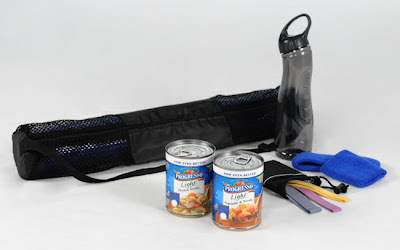 One winner will receive a VIP coupon for a free can of Progresso soup, as well as a yoga mat, water bottle, set of aerobic bands, sport headband and two sport wristbands. Follow my blog and tell me which is your favorite Progresso Soup. *Disclosure: Progresso provided the free product, information, and giveaway through MyBlogSpark. I'm a gfc follower and I love chicken noodle. I follow on GFC and I like the Chicken with Herb Dumplings. I am following your blog via GFC (furygirl3132) and my favorite Progresso Soup is the Rich & Hearty Chicken Noodle, so good! Thanks so much for hosting this great giveaway! I eat Progresso Soups at least 3 times a week for lunch. They are very tasty and low points value. I like Progresso Chickarina soup. 1. I entered $50 Staples Gift Card Giveaway. 2. I entered $50 Staples Gift Card Giveaway. 3. I entered $50 Staples Gift Card Giveaway. 4. I entered $50 Staples Gift Card Giveaway. 5. I entered $50 Staples Gift Card Giveaway. Entered the MultiGrain Cheerios prize pack giveaway. and New England Clam Chowder is my favorite. Thanks. I follow and like new england clam chowder! I like yo u n FB! I follow your blog via GFC and my favorite Progresso soup is Chicken and Rice. My favorite Progresso soup is the Minestrone. Follow on GFC and I've always like Progresso's Minnestrone soup. following on GFC (Shannon) and My favorite would have to be Chicken Cheese Enchilada Flavor. Yummy.